Welcome to another post in our Brommapojkarna series! We’ve already seen how BP performed in the 2028 season, so let’s now take a look at our Academy players and how they have progressed in the 2028 season. If you missed the previous post about our academy players, go back and check it out here. Top 5 Academy players in Europe – A look at the very best players in other clubs around Europe who have come through our Academy in recent years. But before we get into the progress of the Academy youngsters, let’s take a look at the results of the Youth Champions League knockout stage. After winning it all in 2025/26 it was quite the disappointment when we were knocked out in the first knockout round last season. After a great group stage we were really looking for a great cup run this year! We were knocked out straight away this season as well, which was truly disappointing considering the fact that we were outstanding in the group stage. Comment: A central defender with nice well-rounded physicals, good defensive skills and some impressive mentals. Prediction: With a Professional personality and some exciting skills I have high hopes of him becoming a BP starter in a few seasons time. Comment: Oh my god! What a fantastic player! Mentals like a seasoned veteran, great physicals and nice attacking attributes! Prediction: With an absolutely insane BPS Rating of 63.00 I firmly believe that this guy has the potential of becoming BP’s best player ever – if we manage to keep him! Comment: Decent keeper with both excellent Aerial Reach and Reflexes. Needs some work on his speed. Prediction: He is showing a bit of potential, but I doubt that he’ll be good enough to overtake Pintos. Comment: A central defender with nice Tackling and fantastic Marking and Positioning! Needs to work on his attacking skills! Prediction: With both his height and defensive attributes he certainly has the chance to earn a first team contract with the club. We also brought in a couple of more players than we’ve done in previous seasons, since we had had a bit too few players in recent years. Comment: A technically gifted striker who made his first team debut for Sao Paulo this season. Excellent movement and a nice personality. Lacks a bit of Teamwork and Passing to go straight into the first team. Prediction: Comes in for quite a hefty fee, but that doesn’t guarantee him a first team spot. He needs to improve his weaknesses in order to overtake the players in front of him in the pecking order. Comment: A really quick winger with nice Dribbling. Needs to work on his mentals as well as his overall passing game. Prediction: With loads of potential and decent Determination I hope that he will progress steadily in coming years. A potential first team player long term. Prediction: With an exceptional BP Style Rating and a 5 star potential I hope that this guy will turn into a true top level midfielder. His only weakness is the toughness, which needs to improve. Comment: A determined hard-working left midfielder. Lacking in many areas though, mainly offensively. Prediction: With loads of potential and great Determination he has the chance of developing a lot, which will certainly be needed if he is to play first team football for us ever. Comment: A 16 year old winger with decent Technique and speed, that comes in from Serbian talent factory Partizan. Lacking in many areas though. Prediction: Doesn’t look like a fantastic player, even compared to other 16 year olds. However, my scouts believe he has a 5 star potential, which was the only reason I signed him. Will need tutoring to be able to reach his potential. Prediction: Even though the competition in midfield is really tough, he doesn’t look too far away from a couple of first team chances. With a current ability of 2 stars and a potential 5 star ability there seems to be quite a lot of development left in him. A future superstar in the making? Comment: A defensively solid right back. Lacking a bit both offensively and physically. Prediction: Even though he’s not a complete player at all he will get his chances in the first team as a back-up option since Jackson is our only DR at the moment. Comment: Our scouts think that this guy has the potential of becoming a world-class player, but it doesn’t really look like it at the moment. He lacks severely technically, but looks decent mentally – besides a low Determination – and physically. Prediction: I got him in because my scouts begged me to, but I’m having a hard time seeing him fulfilling his potential considering he’s miles away from a first team spot at the moment. Comment: Hugely over-priced as domestic talent usually is, this young striker has some nice Finishing and Work Rate. Prediction: I brought this guy in along the lines of our “National Development Plan” meaning that the primary goal is to make him a player for Sweden, not for BP. Hopefully a future Sweden international, but probably never good enough to become a regular BP player. Comment: A really nice all-round forward who has already played two U21 games for Denmark at the age of 17. Prediction: Looks well-rounded but needs to improve every aspect of the game in order to reach the level needed to play first team football at BP. After focusing on the new youngsters taking their first steps on the Academy road to greatness, let’s look at the players who turned 19 during the 2028 season and thereby are graduating from the Academy, hopefully ready to claim first team spots at BP or somewhere else. This year’s graduation class consists of 12 players; 3 Swedish and 9 foreign. Only one player has a 5 star potential, but I don’t think that’s because these players are significantly worse than those from previous years. Instead I’ve noticed that the potential has generally gone down for our prospects as the players in the first team have gotten better and better. This is just natural as the star ratings are relative the quality of players in your squad. They are not always correct either, as they are based on the evaluating staff member’s Judging Player Potential value. Therefore we won’t blindly judge the players based on this, instead we’ll look at each player individually and compare him to the current strength and depth in his position before we decide whether to promote him to the first team or to let him go. Ali Fadhil is a goalkeeper that’s pretty good on the line. He has improved a lot since he acquired the Perfectionist personality through tutoring. He has played 140 games for the U19s /U21s during his three seasons at the club and has improved enough to make one appearance for the Swedish U21s. When looking at the first team squad it’s apparent that we have a clear no1 in Uruguayan international Pintos who is just 22 years old and will hopefully remain at the club for many years. We also have two other keepers in young Swedish international Holmén and former Barcelona player Falcón, who is primarily used as a tutor for our younger keepers. It’s clear that Fadhil can’t compete with Pintos for the no1 spot, so his chance is to be better than Holmén to secure the back-up spot. So, is Ali Fadhil good enough to take Alex Holmén‘s spot as back-up keeper? No, when you compare the two it becomes obvious that Holmén is a much better keeper at the moment. Perhaps Fadhil will become just as good or even better in the future, but that doesn’t matter for us since he’ll never be good enough to become our no1. Therefore, Ali Fadhil will be sold. A left back with his strengths in the physical aspects of the game. He has played 100 games for the U19s/U21s but hasn’t made any appearances for our first team. He has also made one appearance for the Swedish U21s. If you look at the DL’s in the first team you quickly come to the conclusion that left back isn’t our strongest position. Lindh won’t get much better and Augustinsson won’t get any younger. Will Linder become our new left back? Verdict: No, he won’t. It doesn’t matter what the competition looks like, he simply isn’t good enough. I have a hard time seeing him perform against other Allsvenskan teams, let alone European giants like PSG. I wouldn’t even promote him if we were without DL’s completely. Therefore, Leif Linder will be sold. Lehne is a well-rounded right back with decent attacking and defensive attributes as well as mentals and physicals. He has played 70 games for our U19s/U21s in his two years at the club and he has played two U21 games for Norway so far. Our first team looks decent in the RB position, both in strength and depth. Youngster Fernando Augusto was our back-up option behind fellow Brazilian Jackson at the beginning of the season, but has progressed enough to become our no1 choice. Verdict: Lehne is slightly worse than Jackson, but is also a year younger. We’ve been offered decent bids for the Brazilian and I’ll try to cash in on him and will promote Lehne as our new back-up RB behind Fernando Augusto. He came in as a great prospect with amazing First Touch and Technique coupled with nice Flair and Passing, making him an exciting creator in central midfield. He spent both 2027 and 2028 on loan at Allsvenskan team Malmö, where he totalled 53 games, 1 goal, 7 assists and an average rating of 6.90. He came in early this season as a real bargain deal and spent the season on loan at Allsvenskan team Göteborg where he played 23 games with an average rating of 6.96. He is looking like a great midfielder, but will need a bit of work on his defensive skills in order to become a complete midfielder. This guy has really impressed during his time at the club. He has mad two appearances for the first team in between loan spells in Belgium (39 games, 8 goals, 9 assists) and France (18 games, 6 goals, 2 assists). He has also made 5 appearances for the French U21s. The only player on the list with a 5 star potential. Because of the rule of a minimum of 9 Swedish players in the match day squad it’s a bit easier to come through as a Swedish player. Mathias played a total of 20 games for the first team this season and really impressed with a solid 7.31 average rating. Spent the 2027 season at Dutch side Zwolle, failing to impress. Went on a new loan in 2028 to Allsvenskan team AIK where he seemed to have adapted to senior football a bit better, managing a nice 7.11 average rating in 10 games. Came in as a high profile signing at 18 years old having already played 25 games for Argentinian giants Boca. He spent this season on loan at Allsvenskan team Hammarby, playing 25 games. He offers something slightly different than most of our other midfield prospects, having his strengths primarily in defence. After over 60 appearances for the U19s/U21s in his first couple of seasons at the club he got a taste of senior football this season, playing 27 games for our feeder club Assyriska in the Swedish 2nd tier. A quick player with a nice Technique that I brought in late 2027 as a 5 star potential. Upon arrival his potential sadly dropped to 3 stars though. Verbeke spent the 2028 season playing senior football at Allsvenskan team Djurgården, earning a decent 6.96 average rating in 26 games. No less than 8 graduating midfielders this season makes it impossible to promote all of them. Since none of them look like a world class player at the moment, we’ll simple need to look at the first team for any holes to fill. Luckily for a couple of the graduates we are currently a bit short on central midfielders in the first team. Italian star Amendola is our first choice in the more attacking midfield position, while Vitor Farah occupies the more defensive spot. Gonzalez has been a back-up in both positions. Verdict: Gonzalez has been complaining about a lack of first team football all year, and with some new prospects rising up the ranks we’ll try to sell him. We will promote Johansson being the only Swedish player, together with offensive-minded Baiano and more defensive Liendo. We will also keep Buteau, sending him out on a new loan to see if he can improve towards his 5 star potential. The rest will be sold. This guy really impressed this season on loan at Allsvenskan side Kalmar, scoring 16 goals in 27 Allsvenskan starts, making him the league’s fourth best scorer. Let’s look at the first team to see if there is any place for Tico? With 6 players competing for 2 spots up front we are really stacked in the forward position. Lorshag is looking for a new challenge and both Aparicio and Edmilson are wanted by Barcelona, so we might lose a couple of them. Verdict: There are simply too many players in front of him at the moment, I can’t promote him making him forward no 7. However, I’ll keep him in the U21s for the pre-season in case we lose three first team forwards. Now that you’ve learned the fate of this year’s graduating class of 28, we’ll take a look at how our GrassNGear named newgens are doing out in the footballing world! Both Grass and Gear have left the club to go out on adventures of their own, but that doesn’t mean that we’ve forgotten all about them. Let’s see what they’ve been up to in 2028! After two great seasons scoring loads of goals Grass had a pretty disappointing 2028, only scoring 5 goals in 34 teams. As a result of this, his team Sundsvall finished in an equally disappointing 7th place, compared to their top 3 finish the year before. Gear is the undisputed no1 goalkeeper for Turkish side Konyaspor that finished 4th in SuperLig last season. This season he has managed 6 clean sheets in 17 games. With a new Head of Youth Development and a great youth intake, things are really looking bright for the Academy! The first team is starting to get to such a high level where only the very best graduates are promoted to the first team, but hopefully we’ll manage to get the other players contracts at other Allsvenskan clubs, strengthening the league a bit. Over 75 Academy products have left the club since the start of the save, most of them because they weren’t good enough, but some of them left simply because they were too good! Here we take a closer look at the very best of those players, making a name for themselves in various clubs around Europe. We have one new entry at the bottom of the list! 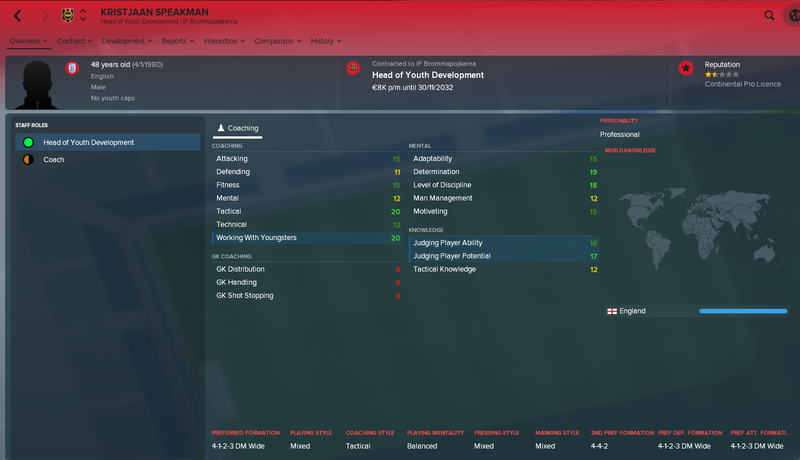 Career at BP: Came through our 2017 youth intake, looking like a future BP legend! Played 26 games for the club over two seasons before the board sold him behind my back. Sold to: Monaco for €1.4M in 2018/19. What has happened since then: Struggled at Monaco, never really impressed enough to become a first team player. Went out on loan to Premier League side Crystal Palace, where he impressed enough to secure a permanent move to Ligue 1 team Bordeaux for €3.8M in 2024. Has played close to 200 games for Bordeaux up to this point. Career at BP: Came in as a 19 year old free agent in 2019 after a great U20s World Cup performance for Italy, earning him a spot in the Team of the Tournament. Played 36 games for us over two seasons with an average rating of 7.38, scoring 8 goals. What has happened since then: Played 14 games for the Juventus first team, before going out on loan to Serie B side Palermo followed by a two year loan at Mexican side (!) Santos Laguna, where he became a key player. Since returning to Juventus in 2024 he played 150 games in the Serie A, before joining PSG in 2027 for €51M. He has already played 70 games for PSG, currently in his second season for the club. Has played 47 caps for Italy so far. Career at BP: Came in for free from Australian Academy FFA in 2021. Played 21 games for the club before being sold to Genk at the end of the season. 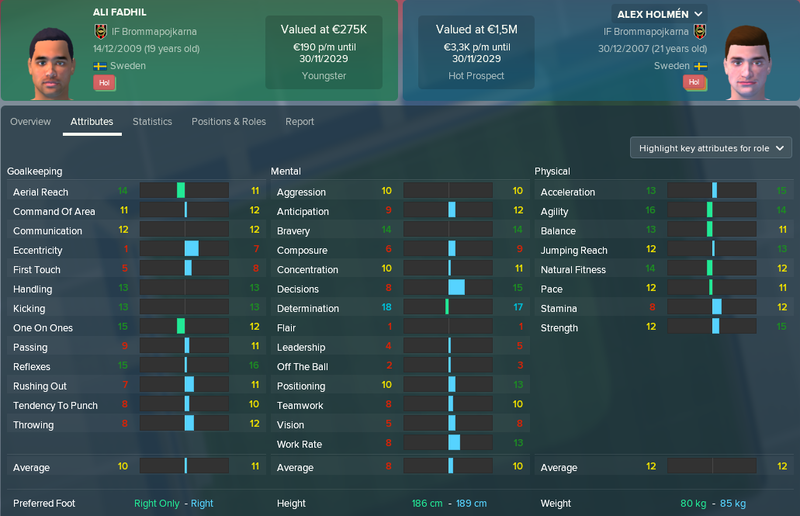 Sold to: Belgian side Genk for €5.75M in 2022, against my will! What has happened since then: Became an important player for the Belgian side straight away, playing regularly from the start, totalling 90 games for them, before moving to Juventus in 2024 in a €20.5M deal, becoming team mate with Venturini! He has played around 150 games for Juventus since the move, becoming an important player for them. Stands at an impressive 76 caps and 33 goals for Australia at the age of 25, naturally regarded as their most important player. Career at BP: He came in as one of four great prospects (Magrão being on of them) in the summer of 2022 from German Third division team München Lions. He was amazing for us in a season and a half, scoring 30 goals in 40 games, before the board sold him off. Sold to: German Bundesliga team Wolfsburg for €4.1M in 2023, against my will! What has happened since then: Has played regularly for Bundesliga side Wolfsburg since his awful departure, with 200 games to his name. He is currently regarded as one of their key players. He has played 7 games for Germany so far. Sold to: Spanish giants Real Madrid for €68M in 2028, in a record breaking deal! What has happened since then: Immediately became a first team player for Real Madrid, despite his young age. He has already played 40 games and is considered an important player for them. He has played 21 games for Sweden as well, scoring on 4 occasions. The next episode will be a bonus episode where we look at the 2028 European Championships and how Sweden fared there! Brilliant read, I love reading about youth development, and the way you write about it is superb! Wow! Thanks for the kind words, mate! I’m still really enjoying both playing and writing! Love your academy blogs and had given me so many idea for my own. Keep up the great work.